*Vinyl reissue with download bonus tracks redeemable from the label* This is the the full length debut from the most precious star in IDIB's constellation. She previously teased us all with a 12" for the aforementioned label last year, a record that has grown and grown and grown in stature round these parts over the last year - to the point were we reckon that "What Did He Say" is just the most amazing, perfect pop record like ever. But that encounter was all too brief, so we're a little giddy at getting to spend a whole album with her. 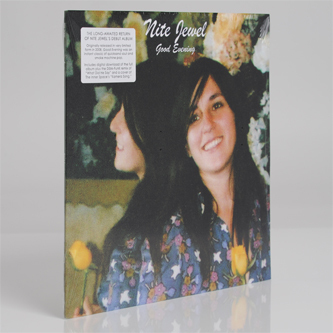 'Good Evening' is released on these shores on the excellently zeigeisty No Pain In Pop label, and contains 10 tracks imbued with that same mesmerizing magic, interpreting by-gone Bronx pop and new age ooze with a hazy impressionism that makes her music so lushly ethereal. It's easy to partly attribute the magic of the sound to the methods of production, as solely recording and editing to a portable 8-track cassette deck will certainly watermark it with a dreamlike quality, but it's more likely that this method helps articulate the muffled influences inside her head in a far more sincere fashion than any hi-end studio gloss could ever provide. However, attempting to dissect these tracks does kill off some of the mystery so we'll just strongly recommend that you check this out if you've ever found yourself moved by The Caretaker, Emeralds, Ariel Pink or Glass Candy. We just love it.